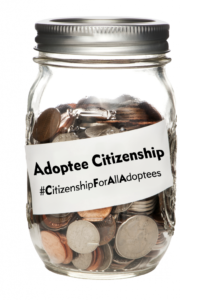 The Adoptee Rights Campaign seeks to raise funds continuing efforts centered around educating and mobilizing support for adoptee rights and the Adoptee Citizenship Act. No donation is too small so please donate now! World Hug Foundation is an official sponsor of Adoptee Rights Campaign and currently accepting donations on behalf of Adoptee Rights Campaign. World Hug Foundation is a registered 501(c)(3) organization and all monetary donations are tax-deductible. Credit card and Paypal options are available through Paypal.